Sunglasses. I can get away with no sunglasses during the winter since it is usually pretty dark when I am driving to and from work, but I need them now! A big winter coat and boots. My husband, but I will do it if I have to. His attention to the lawn is greater than mine. It is not winter and it is not summer. This year we have had some cooler temperatures, hovering around the freezing mark; I think we are used to a little bit warmer weather, but at least it is not snowing and the sun is mostly out. 6. What is your favourite thing about Spring? The warm weather. We really pay our dues during the winter, so it is nice to go outside without a hat or mittens (although we are still waiting for that consistently warm weather!). Not really, there are certain jobs I have to do, like clean out the front closet, but I am not someone who cleans the entire house from top to bottom just because it is Spring. I've always been partial to tulips, but both are lovely. 10. 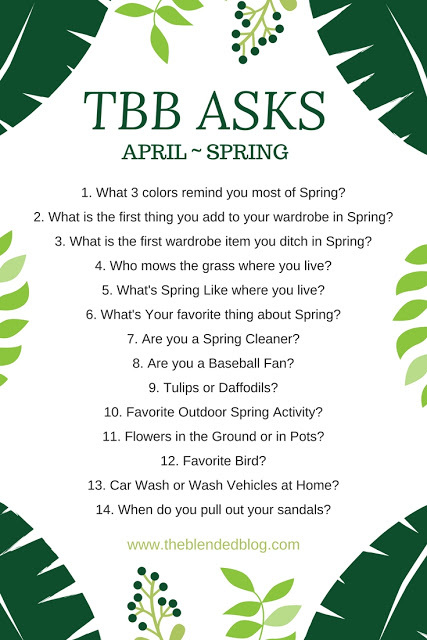 Favourite outdoor Spring activity? Going for a bike ride. For the past two years I haven't ridden a bike (I was pregnant in 2016 and in 2017 Q was too little to go in the bike trailer), so I am looking forward to getting back out there. I love going for a ride after supper. The only ones we have been successful with are potted plants. Our soil is very sandy and it is hard to find something that works in it. Cardinals, and I have heard and seen a few in our neighbourhood lately. 13. Car wash or wash vehicles at home by hand? We usually go to a car wash. I think there is a City By-law that says you aren't allowed to put soap into the sewer system, but I've never confirmed that. We will vacuum and clean the interior ourselves at home though. When it gets about 10 degrees (Celsius), so not yet!